Use your creativity and network to help raise awareness and funds. Your support of Mid-Ohio Foodbank and commitment to our goal of ending hunger is critical; we need your help to spread the word and get others on board! By hosting an event, you are using your creativity and your network to help others learn about our work and inviting them to take part. Send an email to development@midohiofoodbank.org. Having a goal to hit is good motivation! Keep your goal realistic. If you exceed your target, that’s a great feeling for all who have given. You may need to jump-start contributions – nobody likes to be first, so this will encourage others to get involved. Your network is more likely to connect with the cause if they know it’s personal for you. Do you have an experience with food insecurity? Someone you love? Have you volunteered in a food pantry? Don’t be afraid to share more of that story. Make sure to thank folks who give! You can offer a general thank you to the whole group via Facebook or an email, but an individual note to each of your friends is a nice touch at the end of your event or campaign. This approach may help ensure they will be in your corner if you want to try for a larger goal next year. We can provide a page on our website with a unique URL that you can share with your friends. It features a thermometer that will show how close you are to hitting your goal, and it’s a great way to relay your message. You can find the request form HERE. Start by emailing your close contacts. Try sending quick personal messages to your best friends and family to build momentum. Reach out more widely using social media as well. Posts with photos and videos are more likely to be seen, so check out our SOCIAL MEDIA TOOLS for some shareable content. 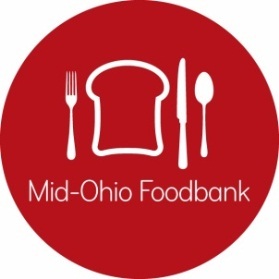 Don’t forget to tag @midohiofoodbank on Facebook and Instagram, and @Mid_OHFoodbank on Twitter. You can also use #EndHunger to drive the point home!